Batchelors Way: I'm All alone!!! Today all my kids went back to school!!! These three went to the High School and Junior High! And these three went to Grade school. This school year marks a lot of firsts. Like this is Quinton's first year of Junior High. This is also our first year to have a Senior. Yes, Austin is a senior. This is exciting and sad to me. I realize this is his last year as a kid, really. After this school year he will begin to make adult decisions that will affect the rest of his life. Thinking about it makes me teary eyed. Seams like he was just a baby and now he's a senior. I will just have to stretch this year out!!! And this is the first year all my kids will be gone all day. Yes, Branden is now in first grade! No more cutting my day in half to get home to my half-day kindergartner. I mean I have all day to do what ever I want with out so many interruptions. So what will I do!!! I have a list a mile looooooooong! As part of a DailyBuzz Moms Tastemaker program I received a Back-to-School kit courtesy of the Clorox Company. Well we use the wipes on door knobs and places the kids touch often. Six kids can bring home lots of germs. The kids can also use them to wipe their desk at school to cut down on germs. The Brita water bottle has a filter right in it. All my kids use water bottles especially the litttle ones. I can't decide who gets it. We will probably just take turns. The last item is so cool. 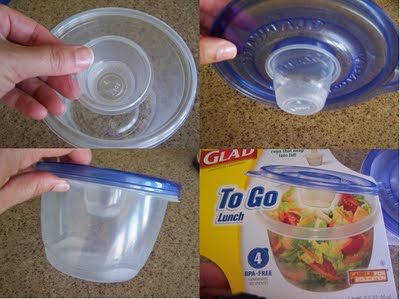 These food storage containers have a little cup inside the bigger cup. So you can take a salad and dressing or anything that requires a sauce. My kids eat school lunches, but my husband takes his lunch every day. He is excited to try these out. I must say they are a pretty clever idea. Thanks Clorox I love trying new things. as well as some pics from the Parade of Homes.